Below is our home bred boy UK & Imperial Grand Champion Silkiestar Raphael, owned and shown to perfection by Sue Jones. 'Raffy' has had great success on the show bench. 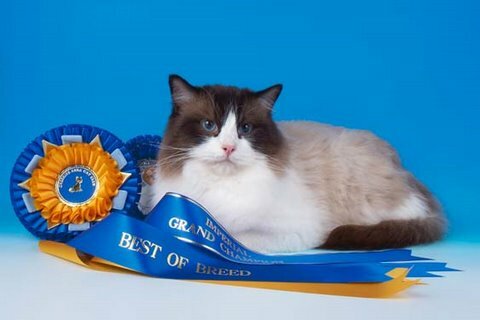 At The British Ragdoll Cat Club show at Stoneleigh in January 2009, he became Best Bi-Colour Adult and Overall Best Exhibit and Best in Show. His list of show acheivements are outstanding with many Red Card Days. We are very proud of this handsome gentleman.